Vienna we are coming! 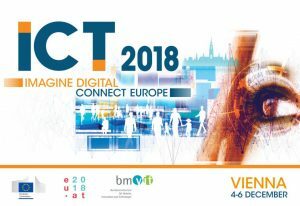 This week the Robogen project team is moving to Vienna for joining the ICT 2018, that will take place in Vienna on 4-6 December 2018. This is a research and innovation event focused on the European Union’s priorities in the digital transformation of society and industry. It will present an opportunity for the people involved in this transformation to share their experience and vision of Europe in the digital age. Join us and stay tuned for more news on the event. Visit this blog for more details. The RoboGen Project has been awarded $10,000 (USD) in credit to Amazon Web Services as a recipient of the AWS Cloud Credits for Research Program (formerly AWS Research Grants) for the second time. RoboGen™ is an open source platform for the co-evolution of robot bodies and brains. It has been designed with a primary focus on evolving robots that can be easily manufactured via 3D-printing and the use of a small set of low-cost, off-the-shelf electronic components. It features an evolution engine and a physics simulation engine. Additionally, it includes utilities for generating design files of body components to be used with a 3D-printer, and for compiling neural-network controllers to run on a microcontroller board. The AWS credits will be used to perform large-scale experiments in distributing Evolutionary Robotics over the web. For Autodesk Switzerland’s 25th birthday, the company is organizing a Design Night event, made in CH. Our professor Dario Floreano will share his vision for evolutionary robotics as a keynote speaker, and RoboGen past, present future will be on show. Come by our demo and say hi! From San Francisco to Neuchâtel, come and discover the very first Design Night Switzerland! 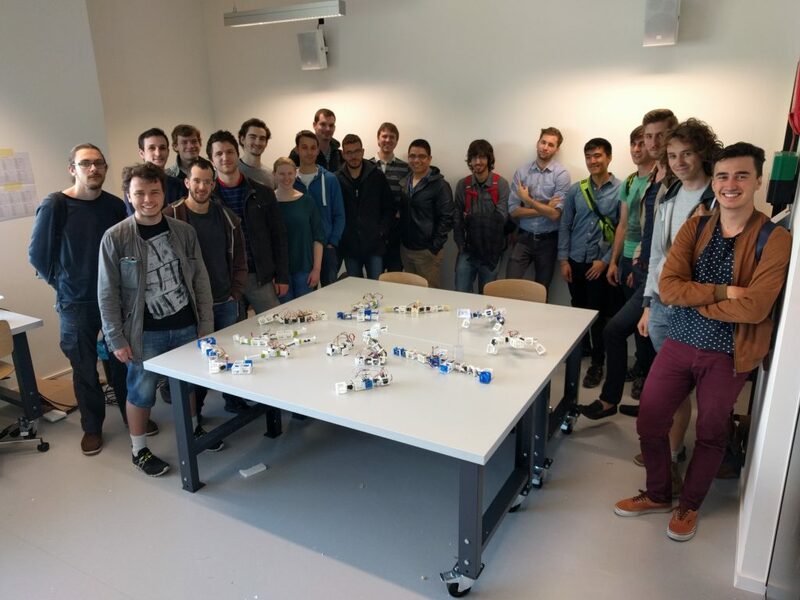 Here you can discover the fascinating world of robotics: precision robotics, industrial robotics or entertainment robotics, all brought together for an unforgettable night of discovery. De San Francisco à Neuchâtel, laissez-vous surprendre par la première Design Night en Suisse ! Venez découvrir l’univers fascinant de la robotique­ : robots de précision, industriels ou ludiques, interagissez pour le fun lors d’une soirée exceptionnelle ! Congratulations to the Artificial Evolution Class of 2016! After more than two months of work, our students have presented their evolved robots today. 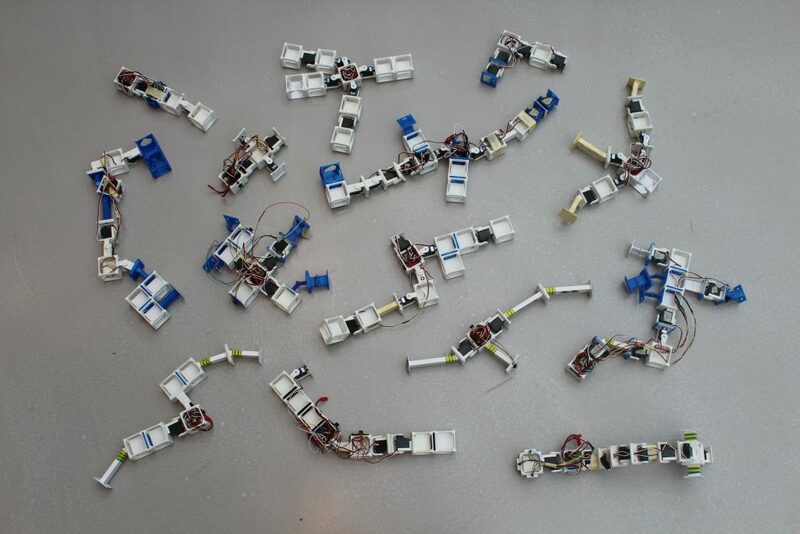 The 14 robots produced exhibited a variety of behaviors in accomplishing their given tasks. Congratulations to all and thanks for your enthusiasm!